In the Penn State area next week? 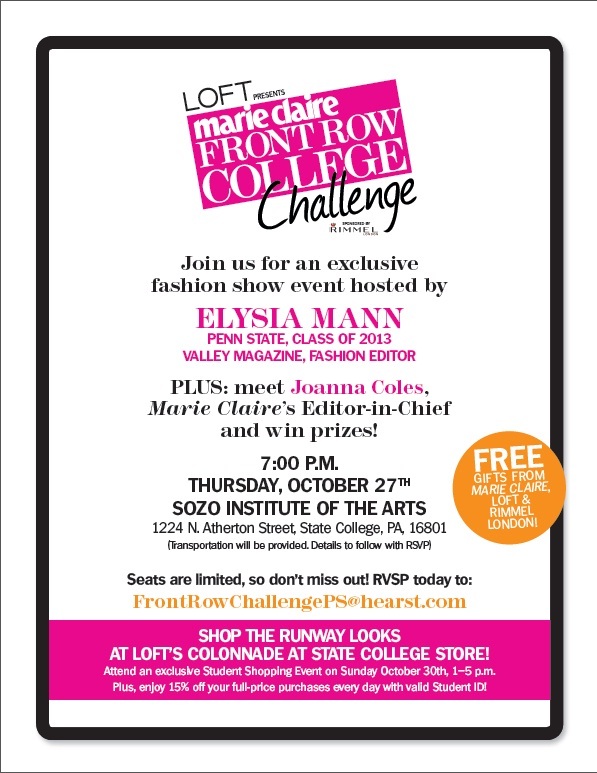 If so you must come to the Marie Claire Front Row Challenge fashion show presented by LOFT! Marie Claire is giving four lucky college students the opportunity of a lifetime. Out of hundreds of entries four students were selected to produce a campus fashion show in attempt to win a 2012 summer internship at Marie Claire, LOFT, and Rimmel London offices. Hello dream job! Each finalist was flown to NYC where they met with Marie Claire fashion editors, LOFT designer time and Rimmel London makeup experts and started the process of putting together their fashion show. Now the shows are starting-four confident women who exhibit not only style, but ambition were selected from Penn State University, University of Texas at Austin, University of Delaware, and University of Alabama. Each girl will put on their runway show at their university for friends, family, and fashionistas to watch. Do you go to one of these universities or live near one? If so, visit LOFT Facebook (HERE) or Marie Claire Facebook (HERE) for details on each event and who to email to RSVP.